Tripura Election Result 2018 will be declared on March 3, 2018. The tenure of Tripura Legislative Assembly ends on March 14, 2018. Tripura Assembly Election 2018 was held on February 18, 2018. Tripura Assembly Election 2018 was held on February 18 for 59 of 60 assembly seats. The scheduled election in Charilam constituency has been postponed to March 12 after the death of Communist Party of India - Marxist (CPM) candidate Ramendra Narayan Debbarma. Some of the prominent candidates in Tripural elections are CPM veteran and Tripura Chief Minister Manik Sarkar, BJP's Ratan Lal Nath, who was the former leader of opposition, BJP's state party president Biplab Deb, Congress veteran Gopal Chandra Roy, Indigenous People's Front of Tripura (IPFT) state party president N C Debbarma and CPM's Aghore Debbarma who is the senior most tribal minister in the cabinet. Counting of votes in Tripura Assembly Election 2018 is underway. The BJP, spearheaded by its Tripura chief Biplab Kumar Deb, is leading in the state as the Bharatiya Janata Party seeks to replicate its victories in Assam and Manipur in the northeast. Tripura comprises of 60 assembly constituencies. A total of 20 constituencies are reserved for Scheduled Tribes, 10 for Scheduled Caste and the remaining are for the general candidates. The number of candidates who contested the Tripura Assembly Election is 297. Of these, 20 are women. According to the State Election Commission, 25,69,216 electorates were eligible to cast their vote in Tripura Assembly Elections 2018. Of these, 12,65,785 were women. On February 18, Tripura saw 92 per cent voter turnout, setting a new record in the electoral history of India at 3214 polling stations. 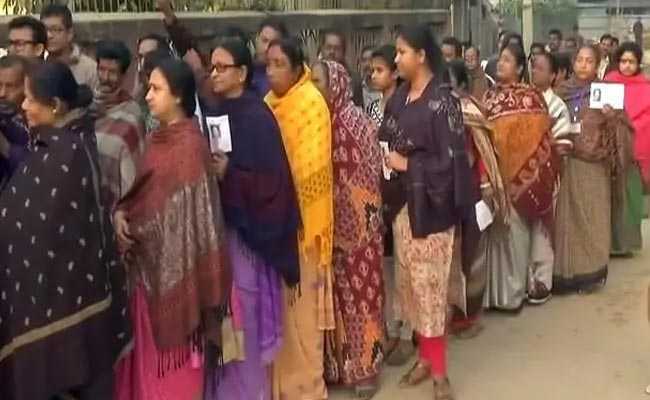 Four prominent parties are fighting the poll battle in Tripura - Communist Party of India (Marxist) (CPM), Indian National Congress (INC), Bhartiya Janta Party (BJP) and All India Trinamool Congress (AITC). The ruling Communist Party of India-Marxist (CPI-M) fielded 57 candidates leaving one seat each to its Left Front partner Communist Party of India, Forward Bloc and Revolutionary Socialist Party. The BJP fielded candidates from 51 seats and left nine seats for its electoral ally, the Indigenous People's Front of Tripura (IPFT). Congress candidates contested from 59 constituencies while Trinamool Congress contested from 24 seats. In the 60-member Tripura Assembly Elections, a party would need 31 seats to get a clear majority. The BJP's poll war cry for Tripura polls has been 'Chalo Paltai' or 'let's bring change', but the clean image of CPI (M)'s four-time Chief Minister Manik Sarkar may hold the key to the Left continuity. Tripura Election 2018 Exit Poll, however, predict that BJP will dethrone the ruling party, ending Left Front government's 25-year-run. JanKiBaat-NewsX has predicted that the BJP-IPFT alliance in Tripura will win 35-45 seats with a vote share of 51 per cent. The CVoter Exit Poll has predicted a close finish in Tripura, with the CPI-M likely to get 26 to 34 seats with 44.3 per cent vote share, the BJP and its allies 24 to 32 seats with a vote share of 42.8 per cent, while the Congress may win only 0-2 seats with a vote share of 7.2 per cent.